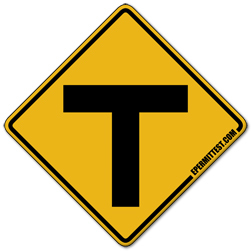 T intersection. One of the intersection traffic signs. The road you are traveling on ends straight ahead. Slow down and prepare to stop before turning. Most T-intersections will feature a YIELD sign or a STOP sign to remind you to give the right-of-way to cross traffic.